SEA GIRT, NJ USA -- HEALTHCARE UPDATE NEWS SERVICE -- MARCH 20, 2019: When the Wisconsin Medicaid managed care program was expanded to include members who had traditionally opted out of the program, the HMOs that were going to serve these members had to optimize their member engagement strategies. Independent Care Plan (iCare), one of the HMOs selected as a Medicaid plan, identified early member engagement after enrollment as a key to success for the program. 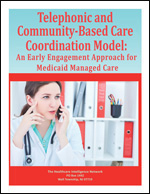 Telephonic and Community-Based Care Coordination Model: An Early Engagement Approach for Medicaid Managed Care outlines how iCare has structured its care coordination team, including both telephonic and boots on the ground staff to find, engage and assess Medicaid members. In this 25-page resource, Lisa Holden, vice president of accountable care, iCare, shares the key elements of its care coordination model that has allowed it to achieve a 90 percent health risk assessment completion rate within 60 days of enrollment.